2018 is off to a busy start for efforts to end the use of the death penalty. Numerous state houses are considering legislation to either repeal or limit the use of the death penalty, and several others are gearing up for active legislative sessions. Since 2014, Washington has been in a Governor-imposed moratorium, and there have been calls from the Governor and Attorney General to pass repeal legislation. Thanks to bipartisan efforts, the chance to end the death penalty in Washington State this year is strong. Things are moving quickly in Washington due to its 60-day legislative session. A death penalty repeal bill has been passed in the Senate, and we are hopeful it will continue its way through the House with similar bipartisan support. In Kentucky, death penalty repeal bills have been filed in both the House and Senate. Utah is also considering a repeal bill in its House. Local partners in both states are encouraged that the death penalty is in its final days. Severe mental illness (SMI) exemption bills have been filled in both Ohio, South Dakota, and Kentucky. These bills would ban capital punishment for those diagnosed with a severe mental illness before the time of their crime. Strong coalitions of mental health advocates and death penalty activists in both states are leading these efforts to protect a vulnerable population. In addition, both New Hampshire, and Louisiana are preparing for death penalty repeal efforts as part of their upcoming legislative sessions in the coming weeks. A few outlier states are also attempting to bring back or expand the death penalty. Despite the record low level of public support for the death penalty recorded in an October 2017 Gallup poll, lawmakers in the Iowa Legislature attempted to restore the death penalty. Thanks, in part, to the dedication and persistence of CMN supporters in Iowa, both the House and Senate bills were never brought to a vote. New Mexico also had a quick and unsuccessful attempt at restoring their death penalty. Similarly, South Carolina is currently debating two pieces of legislation that would expand the available methods of execution. One bill would shield the source of the state's supply of lethal injection drugs - a so-called "secrecy law." The other bill would expand the available methods of execution by restoring options like the electric chair as acceptable means to carry out executions. Your prayers and advocacy will be critical to ending the death penalty once and for all!! Look out for more updates as these legislative sessions continue. If you live in one of these states, CMN will be contacting you soon with ways to raise your voice for life! Looking for additional ways to help end the death penalty? 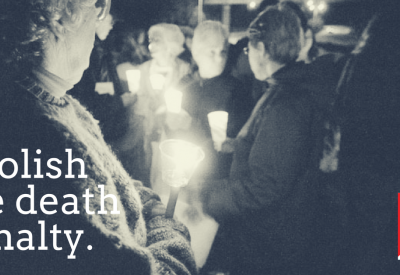 Sign the National Catholic Pledge to End the Death Penalty, or join Mercy in Action to raise your voice for those awaiting execution.